Cell specific reporters are great tools to visualize cell and developmental processes in living animals as their characteristics can be easily identified, selected, or measured. For generation of mutant strains containing integrated GFP reporters, it is required to determine whether or not the desired strain is obtainable by setting up the necessary crosses and following the progeny. If the reporter and the mutation are located closely, it would be difficult to combine them and isolate the desired genotype. Lateral hypodermal seam cells are epithelial stem cells in C. elegans which have been utilized as a great tool to study numerous biological processes such as cell fate, cell signaling, asymmetric division, cell polarity and developmental timing. Seam cell specific transcriptional GFP reporter (scmp::GFP, wIs51) which expresses GFP in all seam cells at all developmental stages, was originally made by M. Fukuyama and Jodie J. Kasmir in Joel Rothman laboratory (Terns et al., 1997; Koh and Rothman, 2001) and has been utilized in numerous studies. However, although the insertion site of wIs51 is previously reported to be on chromosome V, its precise location is not known. 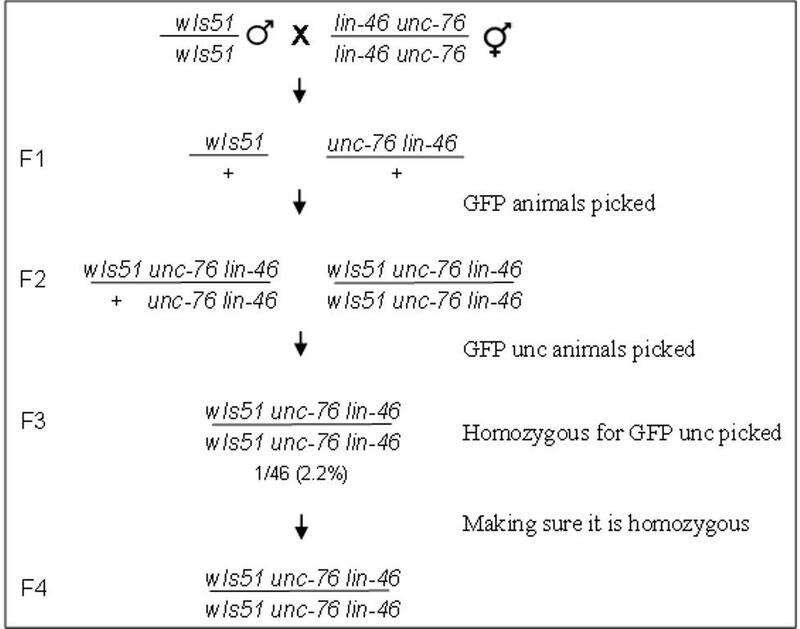 Here we report that wIs51 is closely linked to unc-76. During a series of genetic crosses between double mutant unc-76(e911) lin-46(ma164) and wIs51 we obtained the recombinant animals unc-76(e911) lin-46(ma164) wIs51 at 1/46 (0.022) frequency. Therefore, the genetic distance between unc-76(e911) 46(ma164) and wIs51 is 2% or 2 centiMorgan on chromosome V. Worms are diploid and progeny will have a chance to receive such a recombinant chromosome from either oocyte or sperm. Thus, the chance of progeny receiving two recombinant chromosomes will be quite small. Further evaluations confirmed the presence of lin-46(ma164) by DNA sequencing in addition to the presence of GFP (wIs51) and uncoordinated phenotype of unc-76 in the recombinant animals. More precise mapping, such as physical mapping would be necessary to identify the exact physical location of wIs51. This finding will be informative to those who are planning to incorporate wIs51 to their C. elegans strains. Koh K and Rothman JH. (2001). ELT-5 and ELT-6 are required continuously to regulate epidermal seam cell differentiation and cell fusion in C. elegans. Development 128, 2867-2880. Terns RM, Kroll-Conner P, Zhu J, Chung S and Rothman JH. (1997). A deficiency screen for zygotic loci required for establishment and patterning of the epidermis in Caenorhabditis elegans. Genetics 146, 185-206.